Use stock indices to help map out a trading strategy. 1. What Is Sensex in the Stock Market? 3. 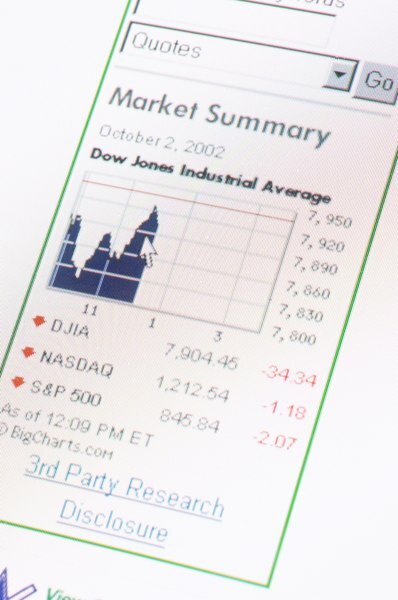 What Are the Differences Between the Dow Jones, NASDAQ & S&P 500? The Dow Jones industrial average, also known as the Dow; the S&P 500; and the Nasdaq composite are the three primary U.S. stock market indices. They act as stock market direction indicators and react strongly to positive and negative financial and world news. Each index focuses on different stock market segments and measures market sentiment. Understand that each index computes its value differently. The Dow is price-weighted, which means a $1 change in a $20 stock has the same effect on the index as a $1 change in a $70 stock. The S&P 500 is a weighted-average index, meaning that larger companies will have a proportionately greater influence on the index value than smaller ones. The Nasdaq composite is a market-value weighted index, which means the index’s value is based on the last trading price of a stock multiplied by the number of outstanding shares. Remember that each index reflects the economy and general market conditions differently. The Dow is composed of 30 of the nation's largest and most influential companies, including General Electric, AT&T and IBM. As such, the Dow reflects the price movements of a few large companies rather than the broader market. Compared with the Dow, the S&P 500 is a better measure of the economy’s overall health. It contains 500 stocks that represent different segments of the economy rather than focusing on a few large companies. The Nasdaq composite concentrates on technology stocks and includes such tech heavyweights as Apple, Google and Microsoft. Use free financial websites, such as Yahoo Finance, to follow stock index activity. The Dow, the S&P 500 and Nasdaq composite are quoted and read in points, not dollars. They also measure the percentage of change in the stocks making up their index. For example, if the Dow opened in the morning at 13,500 points and closed up 25 points at 13,525, it would be reported as a 0.19 percent increase in the Dow. Looking at another example, if the S&P 500 opens at 1,470 points and ends the day up 1.50 points at 1,471.50, it is reported as a 0.10 percent increase. Likewise, if the Nasdaq composite starts the day at 3,110.00 points and closes 5.00 points lower at 3105.00, it is reported as a 0.16 percent drop. Use other indices such as the Nasdaq Large Cap Index or the Dow Transportation Index for information on a specific market sector. Is the Total Stock Market More Stable Than the S&P 500? What Makes Up the NASDAQ Composite?